(Above via: here.) If you find yourself drawn to more masculine design, take some cues from this room. Leave the walls white and the floor unburdened by rugs. Choose neutral bedding that contrasts---beige and black, or white and brown. If you want a touch of femininity without the fussy frills, add a few pillows that feature restrained floral patterns. Accessorize the bedside table sparingly and use an architect-inspired lamp. 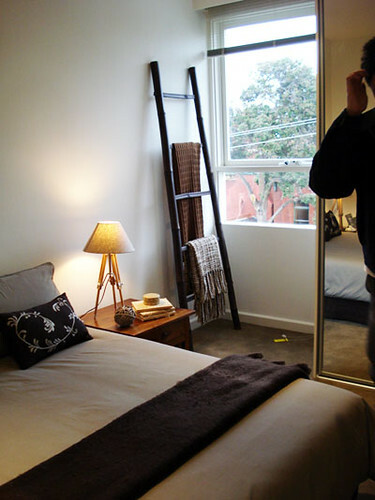 An old ladder works perfectly as a place to drape clothes, blankets, or even magazines. Leave windows undressed. And bring in a mirror since mirrors open up a space by reflecting light. (Above via: here.) This room is sweet and subtly eclectic. Furniture that matches the walls blends in to the room instead of burdening the space. Keep bedding simple and colors pale. A ledge along the long side of the bed is an ideal spot to prop up picture frames. 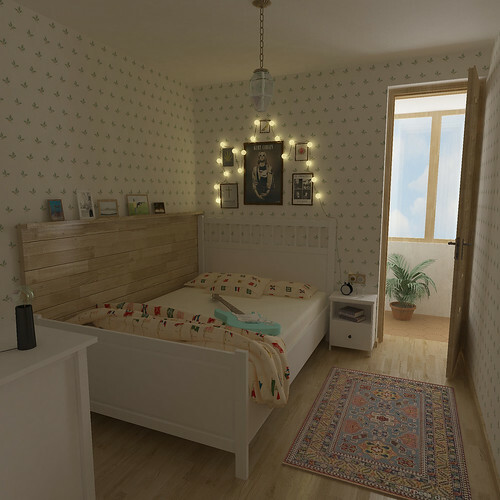 Fairy lights hung above the bed add a little bit of whimsical ambiance. And a prettily-patterned rug in the entry spruces up the floor. (Above via: here.) 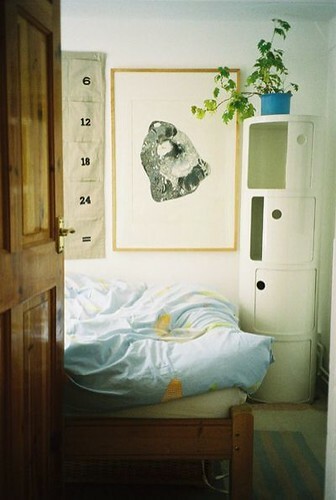 In a teeny tiny space, there may hardly be room enough for a bed, let alone bookcase, dresser, nightstand, etc. So this room features minimal furniture. The tall, rounded storage cubby offers vertical space to stow things away. Bedding is kept simple and comy. And the walls are covered entirely in large pieces of art. (Above via: here.) 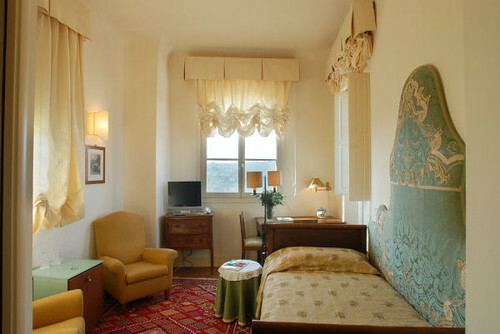 You can find great inspiration from hotel/inn rooms. Take this one for example... as it combines place to sleep, sit, eat, and study all in one room! The room doesn't shy away from color or pattern, but uses both with restraint. Keep walls neutral and dress the windows in curtains that match the walls. A lightweight table draped with a cloth works great as a nightstand, and can be moved closer to a chair to act as an end table. A big, beautiful upholstered headboard is placed along the long side of the bed---making the bed appear to be a sort of daybed. The tv is placed on a chest with drawers so that things can be tucked away within it. And the table behind the bed can serve as both a dining table and desk for studying. The rug adds rich color and pattern without overwhelming the space. (Above via: here.) While black walls wouldn't be the first color you'd think of for a small space, it can work if there's an abundance of white. (Just remember, your landlord/college department of residence probably will look down on you asking to paint your walls black.) But what I really want you to take from this room as inspiration is the bed. 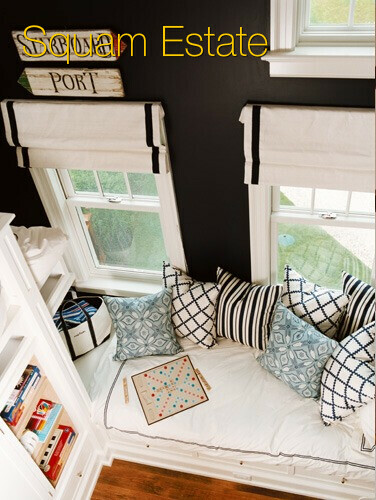 By pushing the bed up against the wall and surrounding it with bookcases, you can create a type of built-in daybed effect with lots of storage. keep bedding simple, accessories subtle, and add lots of comfy, different patterned pillow (preferably with similar colors) to transform your bed into an inviting, cozy nook. Love, love, love these posts! The last one especially. These are great pictures for inspiration. Dorm room decorating is so much fun and college bedding is probably the best way to brighten up a dorm room space. Rachel--I agree. Bedding is definitely the easiest way to change how a room looks. And there are so many options!